Heavenly waterfall pools, enrapturing volcanoes and dramatic natural beauty. Visit lush green Hawaiian islands born in fire. With its tropical beaches, unique landscapes, and welcoming culture, Hawaii is a true island paradise. Graced with spectacular natural beauty, the ultimate cruise destination boasts some of the most breathtaking sights on Earth. Cruise the dramatic coastlines of Kauai, tour Maui’s breathtaking Hana Highway or hike the otherworldly landscapes of the Hawaii Volcanoes National Park, which is home to one of the world’s most active volcanoes. 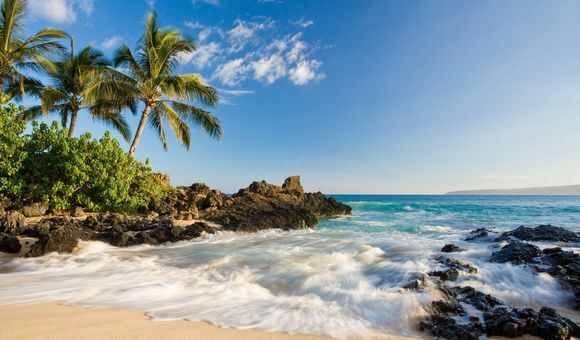 Hawaii is the perfect cruise destination for beach lovers, with a stunning variety of white, yellow, green, red and black sand beaches on which to kick back and relax. A host of the world’s hottest surf spots like Oahu’s North Shore and Waikiki Beach await the adventurous, and history buffs can join more than 2 million annual visitors to the somber USS Arizona Memorial at Pearl Harbor. Hawaii cruises depart from Honolulu, Los Angeles, Vancouver, Seattle and San Francisco. Honolulu is the beating heart and state capital of Hawaii, situated on the third largest island of the Pacific Archipelago. An island of contrasts, Oahu lures visitors with its pristine beaches, rugged coastlines, turquoise waters, volcanic landscapes, world-renowned surf, rich cultural heritage and intriguing – at times dark – history. An eternal summer and the island’s genuine Aloha makes Honolulu the idea cruise destination year-round. Once a fishing village in the early times, Hilo is the only city on the Island of Hawaii. Hilo’s vibrant town is based on a crescent-shaped bay where a collection of well-preserved centuries-old wooden storefronts have been converted into art galleries, gift shops, and cultural sites. Just a few miles south of Hilo is Hawaii Volcanoes National Park, occupying over 333,000 acres of hiking trails, volcanic craters, scorched deserts, rare rainforests and home the Kilauea, one of the world’s most active volcanoes. Lahaina is a port village on the island of Maui and is the second largest island of in the Hawaiian archipelago. Also known as ‘The Valley Island’, Maui is renowned for its spectacular white, black, red and gold sand beaches. Also a watersports hotspot, Kanaha Beach is a favorite among windsurfers whilst Makena Beach's golden sands is a perfect place to disconnect from the world and relax. Kauai is the oldest and northernmost island of Hawaii. The affectionally nicknamed ‘Garden Island’ for best-known for its luscious, centuries-old rainforests, sharp mountain spires, staggered cliffs and spectacular waterfalls, some of which are only accessible by air or sea. Nawiliwili is a port village southeast of Kauai and serves as the cruise gateway to the island. Kailua-Kona, famous for its coffee farms, rugged coastline and historic landmarks straddles the west coast of Hawaii’s Big Island. The village was once the retreat for Hawaiian royalty, today welcoming hordes of cruise visitors with its staggering natural beauty, watersports and architectural heritage. A must-see landmark is the beautiful former royal vacation home Hulihee Palace, which is the perfect place in Kailua Bay to watch the sunset. Kahului is located in Central Maui and serves as one of the main gateways for those visiting this island. Kahului’s ideal location allows visitors to explore some of the most acclaimed attractions of the island such as Iao Valley State Park, a stunning 4,000-acre area of tropical forest with incredible panoramic views and home of the iconic Iao Needle. Mount Kilauea is situated on Hawaii’s Big Island and is the most active of the archipelago’s five volcanoes. Welcoming more than two million visitors each year, Mount Kilauea offers an adrenaline packed experience. When the conditions allow, visitors can drive in close to the volcano’s crater for the opportunity to witness spectacular lava sites. Hawaii offers an appealing blend of fascinating culture, diverse natural scenery, warm tropical climate, and active volcanoes. It's easy to see why these islands are such a popular cruise destination. Hawaii consists of eight main volcanic islands, many of which are still active today. Its unique and colorful culture reflects its indigenous Hawaiian, North American, and Asian heritage. Its rich history, azure blue sky, beautiful beaches and a variety of historic sights make it a popular destination for tourists and surfers. Every island in Hawaii is unique. To see the most of Hawaii in the shortest amount of time, waking up on a different island each day, consider a Hawaii cruise. Hawaii cruises depart from a variety of West Coast ports, including San Diego, San Francisco, Los Angeles, Long Beach, and Vancouver. Hawaii may also be part of a transpacific or repositioning cruise, such as a cruise to Australia or the South Pacific. Just one ship sails the Hawaiian islands all year long: Norwegian Cruise Line's Pride of America, which undertakes 7-day cruises from Honolulu every week. Board this ship for a truly immersive Hawaiian cruise vacation! Honolulu is the largest city and the main gateway to Hawaii. It is made up of a diverse mix of ethnicities and is best known as the business epicenter of Hawaii. The concentration of modern high-rise towers rising up from a surrounding tropical rainforest make for an impressive contrast of man-made and natural wonders. A vibrant, cosmopolitan city made prosperous by its beautiful Waikiki Beach, Honolulu is one of the best places to visit in Hawaii. Take a stroll around the south shore of Honolulu and check out the cultural centers, as well as the Iolani Palace, a historical landmark in downtown Honolulu. As one of the world’s premier tourist destinations, Honolulu is used to welcoming visitors, and has an excellent infrastructure and an assortment of things to do. Ready to book your Hawaiian cruise vacation? Don't wait! Call our cruise experts today at 1-888-403-1425, or search cruise deals for the best deals on Hawaii cruises. For inspiration on where to go for your next cruise, see our overview of top cruise destinations.